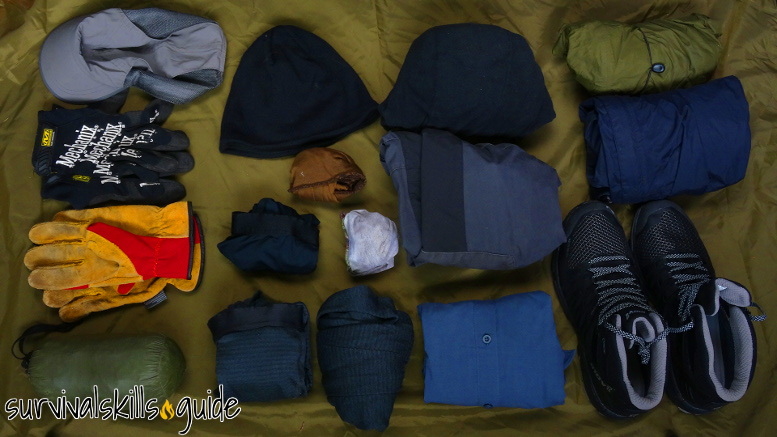 I wrote this bug out bag list based on my experiences as an ultralight thru-hiker, outdoor professional, and survival adventurer. It’s a complete, practical, no-nonsense list for beginners wanting to build their own bug out bags. 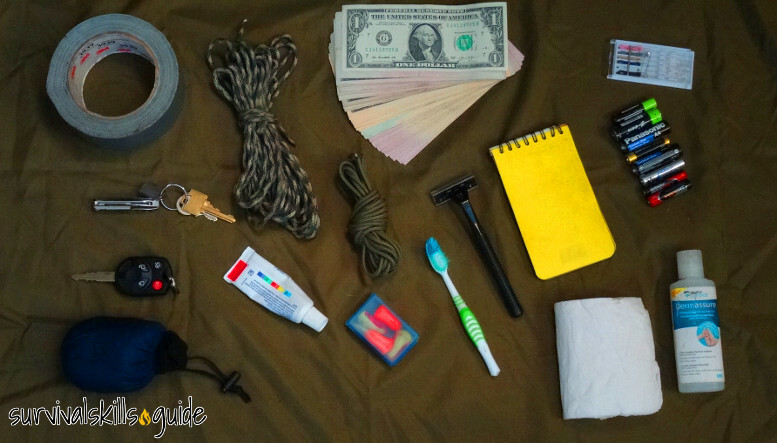 So what’s a bug out bag anyway? It’s basically a backpack that you can quickly grab and go when evacuating your home during, or before a disaster. The potential reasons for evacuating vary: earthquakes, wildfires, hurricanes, social unrest etc. Your bug out bag should have the things you need in the short term, like water, food, shelter, clothes, and money, as well as important documents. It should also be useful for disasters like blackouts or tornadoes that force you to stay inside your house. Do you live in a disaster prone area? 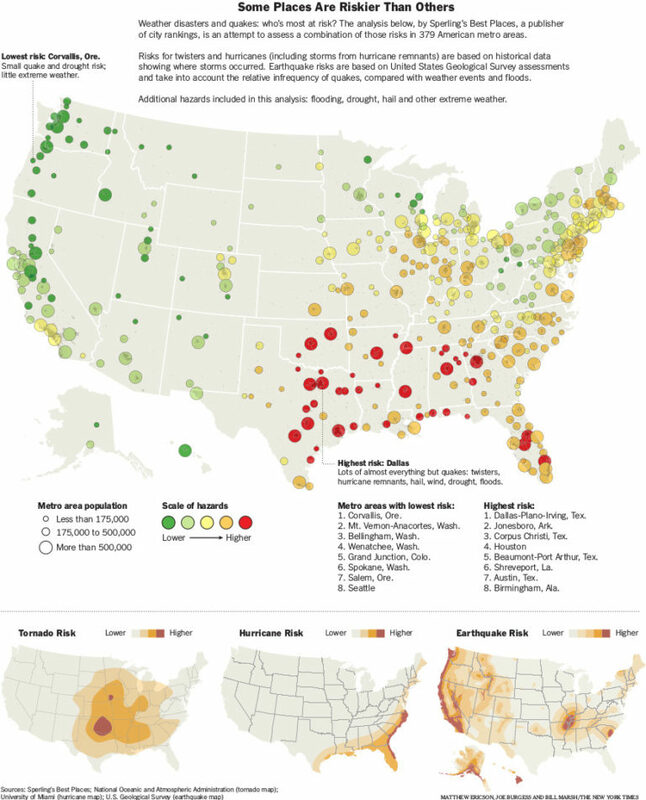 What type of disaster could happen near your home? I’ve researched the hazards near my community to build a bug out bag focused on those risks. I live in a small community near a nuclear facility, downstream from a big dam, and near a forest. 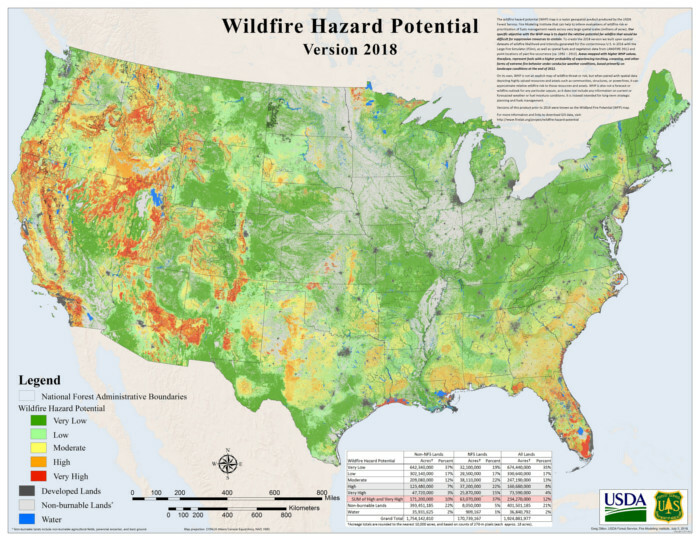 So a nuclear disaster (low probability), dam failure (low probability), and a wildfire (high probability) are the three main hazards I’ve identified. I’ve prepared my bug out bag mainly for a quick evacuation due to a nearby wildfire. Now, your bug out bag list will look different than mine but the core of the bag should be very similar. I’m writing this list from a one person per bag perspective. Your family needs only one radio for example, but you should have clothes, sleeping bag, and water etc. for each person. Another important thing to consider when planning your bug out bag is where and how would you evacuate in case of a disaster. Most likely you would hop on your car and drive to a shelter, or the house of a friend or family member. If you have no access to a motor vehicle you might have to evacuate by foot or bicycle. In that case, your bag should really be lightweight and easy to carry. 2-3 quarts/person/day. Gatorade bottles (28 oz) have a wide-mouth, so they are easy to refill, inexpensive, and durable. Regular disposable water bottles also work great. Avoid big water containers because they are awkward to get out of the pack. But if you really want to carry a big container, I suggest an MSR dromedary bag, they come in 6L and 10L sizes and are extremely durable and don’t leak. If you also have a water filter, check that the water bottle’s mouth is compatible (the sawyer mini works with regular bottles only, not wide-mouth). Pack 9 quarts for hot climates or 6 in more temperate climates. Some people like metal bottles because they could boil water in them; another advantage is that they are less likely to break if the water inside them freezes (and you can melt the ice back to water). As an ultralight hiker, I would never carry so much water in a pack; the thing is, you never know if you’ll be stuck somewhere with only the water in your bug out bag. Water is life. Aquatabs are my favorite, one capsule takes 30 min to treat 2 quarts of water (I put 1 tablet in each bottle). They have a 5 year shelf life, and they are effective against giardia, virus and bacteria. 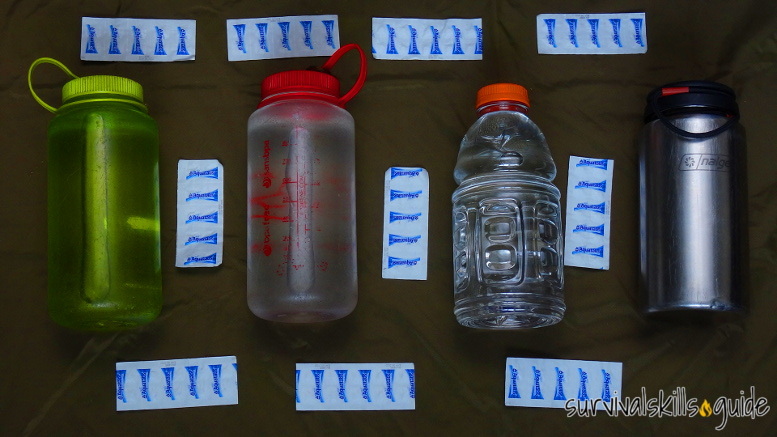 Water treatment tabs are lightweight, practical and my go-to emergency treatment method. You could treat water for an entire week if you needed to. The filter is not needed if you have enough treatment tabs, but many people have one. I would recommend the sawyer mini filter because it’s affordable, light, and versatile: it can be used as a gravity filter, like a pump, or an inline filter. Something nice about filters is that they remove floaties. You might need to evacuate in varied weather conditions so your bug out bag should have clothes for rainy, cold, or hot weather. Outdoor clothes are your first line of defense against the elements, they are one of the most important pieces of gear you can have in an emergency. Any inexpensive rain jacket and pants will do. Rain jackets won’t keep you dry in persistent, torrential rain though. If you really want to be dry in constant rain, wearing your rain clothes underneath a rain poncho is the way to go. Don’t expect a 5 dollar rain ponchos to last. You could be wearing slippers when a disaster strikes, so pack comfortable shoes that allow you to work outside and walk for a long time. Trail runners or hiking shoes are a lightweight and compact option. Fleece jackets are warm and packable. You can find good, cheap ones at the thrift store. Just one pair is enough. I prefer synthetic underwear when camping because it dries quickly. Synthetic shirts are quick dry and they work great in both hot and cold weather. They also protect you from bugs if they have a loose fit.You can roll the sleeves up in warm weather. Avoid cotton shirts unless you live in a desertic climate (they keep water next to your skin and cool you down when moist). They really make a difference in the cold. Most outdoor clothing systems are made to work with base or thermal layers. These wick moisture away from your skin to keep you dry and add insulation. I like tubular bandanas because they are super versatile and can be used to keep my head warm or to protect my neck from the sun. Avoid cotton socks. If you live in a colder climate consider wool socks; they are the best socks for outdoor activities. I like that convertible pants are light, quick dry, and turn into shorts without the added bulk. Any hat with a forward facing brim will do. Gloves can protect your hands from the cold, and while working or using tools. I like my mechanix gloves as all-purpose gloves. I encourage you to add synthetic or down jackets to your bag. They are compressible and very warm. Medium weight fleece jackets are another great option. There are no good gloves for sub-freezing weather. Only mittens keep your hands warm. Fleece neck warmers are compact and make a big difference. They protect you face from the cold wind; used in conjunction with a warm hat, they offer the same protection as a balaclava. An overshoe can turn your regular shoes into tall, waterproof boots. I like NEOS overshoes and Tingleys. NEOS are lighter but more expensive. I’ve found that Tingleys are more waterproof (my NEOS started leaking after lots of use). Thick wool socks are great for the cold, but make sure they don’t cram up your toes when worn inside your regular shoes (reduced blood circulation makes your feet cold). Waterproof gaiters will keep the snow out of your shoes if walking in deep snow. I prefer bright colored mini BIC lighters that are not “childproof”(you can rip off the safety with pliers). I find the pink and orange colored lighters to be the most visible. Keep some in a watertight plastic bag. Cotton balls dipped in vaseline (petroleum jelly) can light very easily, and burn for a long time. A ferro rod paired with good tinder can be an extremely reliable firestarter. 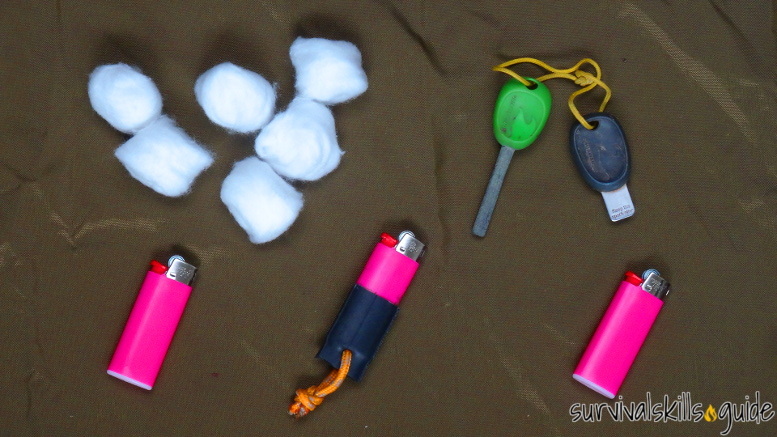 Another good option would be stormproof matches in their waterproof case; they last longer than regular matches and can relight after being submerged in water. In a disaster you might have to sleep in a friend’s house, in an emergency shelter, or even outside if there is no shelter nearby or they are overcrowded. 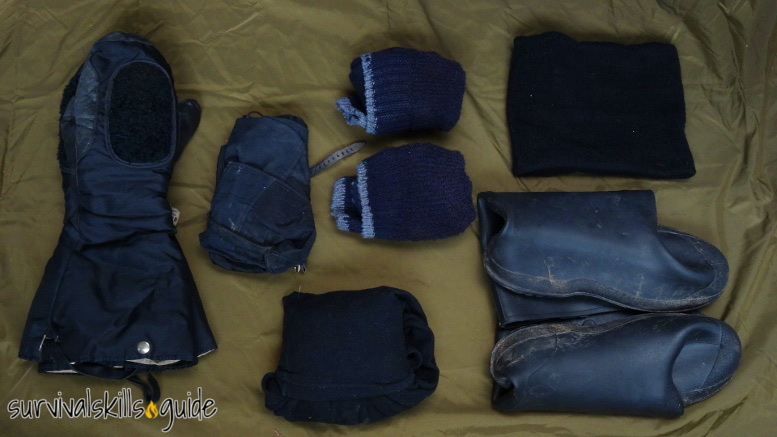 The items that you pack in your bug out bag should help you stay dry, warm, and comfortable in those situations. A tarp is an excellent multipurpose item to have in your bag. 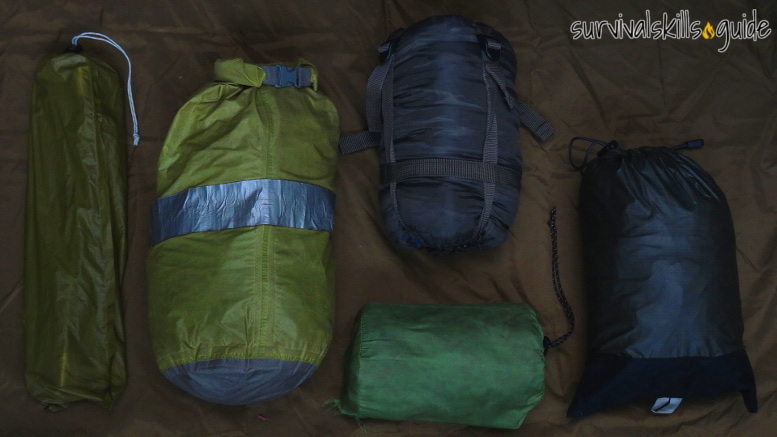 There are cheap bulky tarps and ultralight, but more expensive, sil-nylon tarps. With some patience and rope, you could turn a tarp into a great rain shelter. They can also turn into a burrito roll to keep people warm, can be used as a stretcher, ground sheet, for rainwater collection etc. By no means a necessary item, a tent can be a quick shelter to set up in case you can’t get to a shelter or house. They have a floor so you don’t have to sleep on the dirt and they offer bug protection which is a necessity in bug infested areas. The Big Agnes 2 person ultralight tent is very light (2.4lbs) and high quality, but you could pack a cheaper, but similar tent (2 lbs 10 oz) as long as you go camping with it to make sure it’s fully functional. For warmer climates I would recommend the jungle bag. It is not very insulated, so it’s not very warm. But since it will be compressed in a backpack for a long time, it won’t lose its insulation. If the weather goes below 50 °F, you can sleep with clothes on. Fleece sleeping bag liners are another option that won’t lose insulation if packed. For more temperate climates a 20°F sleeping bag would be a better option. The insulation won’t last if compressed for a long time, so the sleeping bag would have to be uncompressed inside your bug out bag. If having a warm sleeping bag is a priority for you, I would recommend a high quality down sleeping bag rated to the temperatures you might encounter in winter. A sleeping pad will keep you insulated from the ground and will allow you to be well rested. They really make a difference when camping. 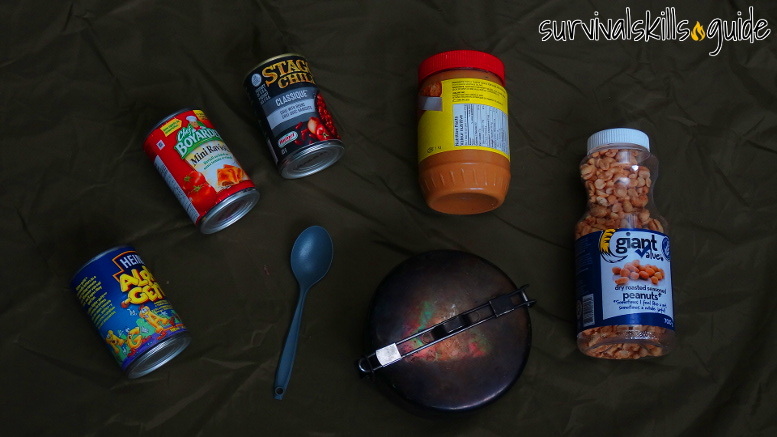 I recommend a compact inflatable pad like the Klymit Static V.
The food that you pack in your bug out bag should have a long shelf life, and be ready to eat, calorie dense, and heat and cold resistant. Many people recommend having dehydrated, backpacking meals and MREs in your bug out bag, but I think true ready to eat food is more practical. There is no need to carry a stove and fuel, or to spend time cooking. Your bag should contain about 2,500 – 3000 kcal per day, so about 7500 kcal minimum. Keep in mind that you could burn much more than 2,500 kcal per day if you are working hard, or are fighting the cold. Dry Roasted macadamia nuts (8.2 calories per gram) are pure fat. They won’t last years of storage though and need to be rotated. Dry Roasted Pecans have about 7 calories per gram as well. Nut butters are another compact option, and most people already have this in their pantries; watch the short shelf life though. They pack some protein in there; although, they don’t offer much more calories versus chocolates. For instance peanut butter has 5.8 calories per gram. These bars are actually a great option for a bug out bag. Protein bars don’t offer the most calories, but they taste good and offer much more balanced nutrition than energy bars. The only drawback is that they should be rotated about every year or two. Contrary to their name, energy bars don’t pack as many calories as roasted nuts, but they do taste good and offer some protein too. Although they don’t pack as much energy as the above options at 4.8 calories per gram, liferaft emergency bars deserve mentioning for their five-year shelf life and ability to withstand hot and cold temperatures. This food has a long shelf life and tastes more like a meal, particularly if heated up. They are heavy though, so I would try to pack other type of food. Having a pot is a good idea because it could be used to treat water by boiling, or for cooking. It could also be used as a bowl. I like my MSR Alpine Stowaway Pot. A spoon is all you need anyway. Avoid sporks because they break right away (unless they are metal). Lots of people recommend the fozzils folding bowl; it’s light and super compact. I just use my pot. I wouldn’t have a stove in my bag, but the approach I would recommend is having an alcohol stove. Fuel for those stoves is widely available; its found in most gas stations as HEET, antifreeze or just 91% alcohol. They are also very light. A document that answers: How will I receive emergency alerts and warnings? What is my shelter plan? What is my evacuation route? What is my family/household communication plan? I suggest having a highway map of your state and maybe a topographic map, or two, of your area. A topo map with a scale of 1:250 000 would provide a good overview of roads and trails in your area but won’t be great for hiking. A good quality compass would be a great asset if navigating with just a map. The compass will not be of much use if you don’t know how to use it though, so learn how to use itst. In a large scale disaster you can’t rely on your smartphone for navigation, the cellphone towers might be saturated. There are some apps that I’ve used that store offline maps like Backcountry Navigator and MotionX-GPS, but they are no substitution for a compass (you might need to save your battery). I personally dislike space blankets because they rip very easily, but one thing that I found them effective for is as a signalling device. If you tie it to a post like a flag or just leave it flat on the ground, it reflects light and attracts attention. 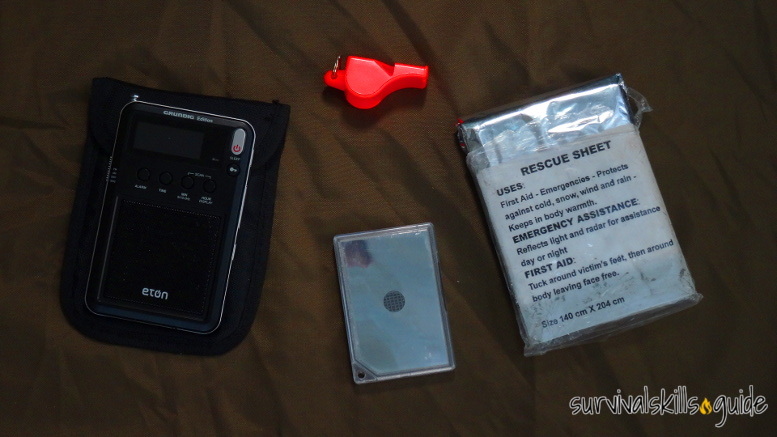 They are one of the most recommended signalling tools to have in your bug out bag. Proper signal mirrors are super easy to use and have been seen from up to 100 miles away. The sound of a whistle can travel farther than the human voice, and it’s way easier to use a whistle for a long period of time than to scream. It’s a simple, yet useful way of communicating. The standard distress signal is three long blasts. It is a good idea to reply with a single whistle blast to let the other person know that they’ve been heard. Pack a waterproof whistle that is loud. More of a signalling tool than a light, glowsticks last a long time so you can leave one on your home’s roof or improvised shelter to attract attention. I would recommend a C. Crane 2 AA battery radio that can tune in to NOAA weather channels and AM/FM. Or a Sony SRF-M37W (3.3oz) that uses 1 AAA, but only works with earphones. I don’t like most hand crank emergency radios because most are very low quality; plus they are heavy and the hand crank might break. It’s better to have a quality reliable pocket radio with spare batteries. Many people like the BaoFeng UV-5R two-way radios because they can be programmed to receive many different emergency frequencies: police, NOAA, fire department, etc. The drawbacks with this radio is that it doesn’t use regular batteries (there’s a special adapter), it’s hard to program it (using a computer and special cable), and you need a ham license to use it as a two way radio (listening is fine). If you have one, you should program your local weather stations in it. A regular AM/FM/weather radio receiver is enough. I’ve used adventure medical first aid kits many times. I like that they are well built, and designed for people trained in first aid and WFA; they don’t just have bandaids in there. I’ve added extra things to mine like a SAM splint. If you or your family has a potentially life-threatening allergy or medical condition, add 2 epi-pens or modify your kit accordingly. 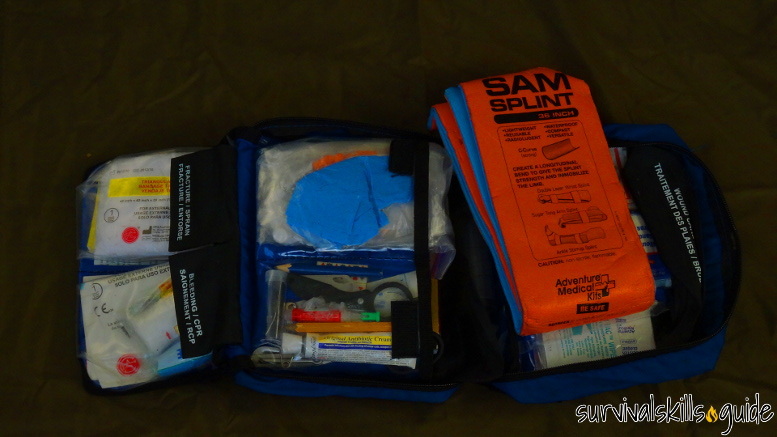 Basically, the first aid kit of our home is in our bug out bag; although, I would recommend having a separate kit if you can afford it. Your bag should have enough prescription medications to last at least 72 hours, or an extended evacuation. You might want to add medicine for indigestion, stomach ache, nausea, and diarrhoea to your first aid kit. Headlamps are more useful than flashlights. They are inexpensive and lightweight. 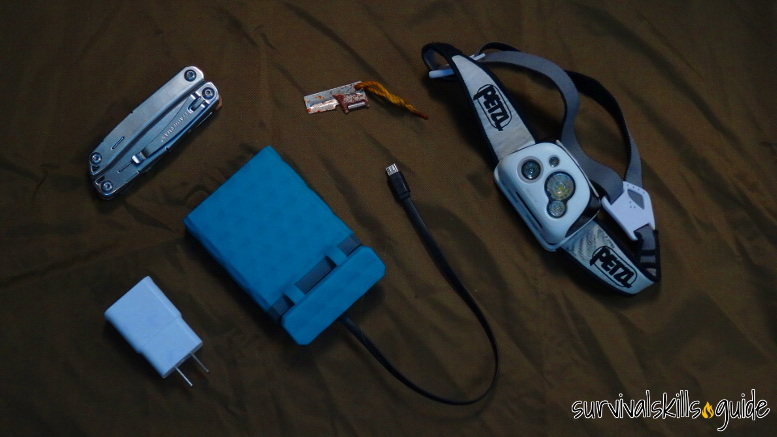 The black diamond headlamp, is waterproof and can be dimmed; it uses 3 AAA batteries. Avoid hand crank and solar flashlights because they are unreliable and inconvenient. I pack a leatherman multi-tool in my bug out bag. It is more useful than a regular knife, and you just can’t know how or when it’s gonna come in handy. Having an external battery pack that can charge your phone in an emergency is a good idea. Avoid cheap solar chargers, they don’t really work unless they have a big solar panel. Don’t let the title scare you, When all hell breaks loose by Cody Lundin is an excellent reference to have in your pack, and to read when preparing your emergency plans and kit. Check this link for more in depth info on how to protect your documents; having a well-protected back-up online wouldn’t be a bad idea. Medical records, copies for each person in the family. Important family documents: like passports, birth certificate, bank records, social security, insurance information such as home and contents insurance. Contact list: of friends and family, as well as emergency services. I have a 1TB hard drive with a back-up of my photos and computer files. Another option is using a usb drive. There are infinite uses for duct tape in an emergency. Rope can be used for setting up a tarp for example. Any thin rope will do. Long lasting emergency candles provide light and last a long time. Debit cards and credit cards might not work immediately after a disaster. Small bills are best. For the radio, headlamp etc. For improvised rain protection, shelter, waste etc. If you live in an area with lots of bugs having a headnet would make a huge difference in your comfort if you were to spend a long time outside. For note taking, sharing contact information etc. All purpose soap, moisturizing cream, razor, toothbrush, toothpaste, hand sanitizer, toilet paper, wet wipes, feminine products etc. For getting a good sleep in a noisy shelter or environment. A 50 to 70 Liter backpack should be able to fit all that gear. Backpacking bags are designed to be worn comfortably for long periods of time. You might want to add items for your specific concerns and the specific hazards in your area. I wanted to keep this list more universal, and not too long. After all, a bug out bag is meant for a short term disaster evacuation; it’s not an INCH bag. 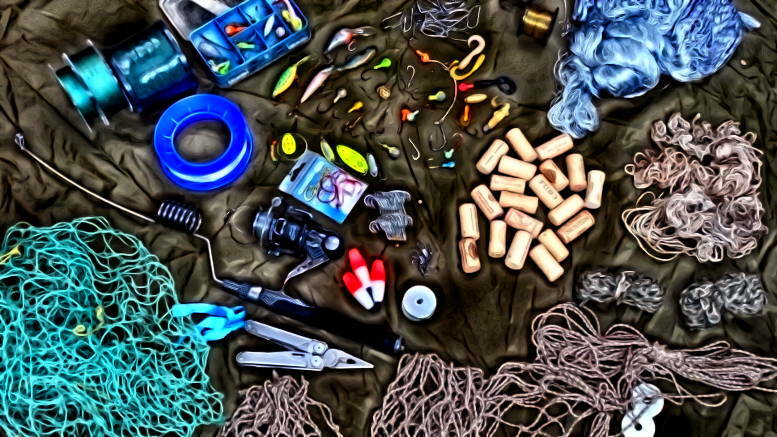 This bug out bag list can be overwhelming, by no means you need to have everything. 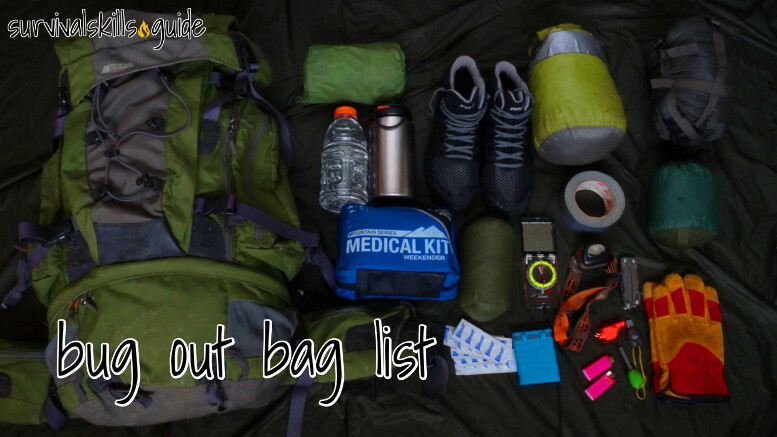 Just pack a bug out bag with the things you already have and take the time to add things gradually. Toiletries Soap, moisturizing cream, razor, toothbrush, toothpaste, hand sanitizer, toilet paper, feminine products etc. 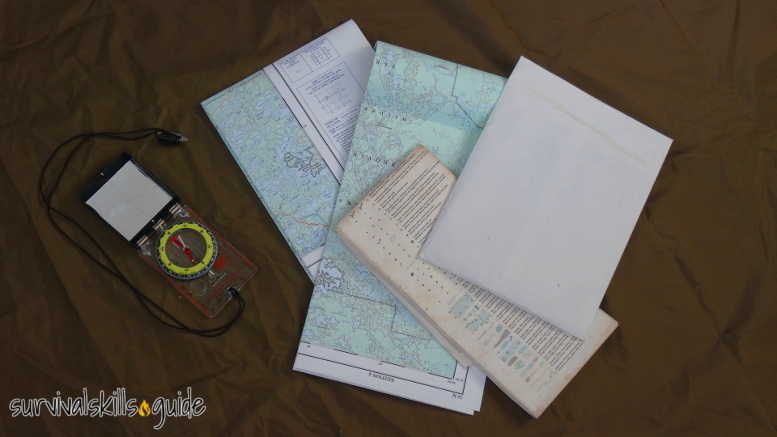 Be the first to comment on "Bug Out Bag List: The Ultimate Beginner’s Guide"